Mini 9 Groovy case - continues as the same Groovy and fun case as its predecessor the Mini 8 Groovy case. Now available in 6 new colors to accessorize your favorite Instax Mini 9 camera. 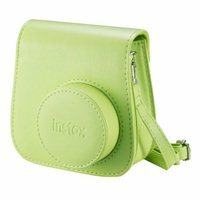 This case is made of poly-synthetic leather, has a quality safety clasp, hand strap, tone on tone stitching and a debossed Instax logo.